Factiva's content search will allow you to locate news media coverage "primarily based on the results of a survey, poll or questionnaire". This search may help you locate or identify an opinion poll or survey on your research area. One you have selected Survey/opinion poll from the content options you can limit your search to a region or country, a topic, a news source or date or date range. Access Factiva via the Library's Databases and Electronic Resources Page. 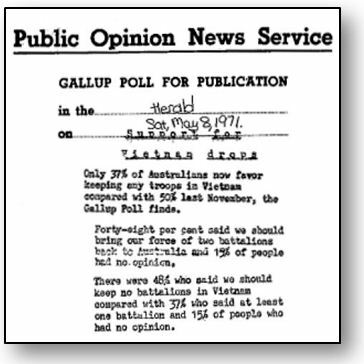 Now available online from Roy Morgan Research Morgan polls and Morgan readership papers Australian and International selected years from 1941 to current. Saulwick poll reprints 1990-91 compiled and produced for The Age and The Sydney Morning Herald by Irving Saulwick & Associates.